I love the sea. The smell of it, the sight of it, the feel of stinging cold water on my legs, the excitement of jumping in for a dive, the thrill of seeing a tiny nudibranch that I haven’t seen before, the heart pounding thrill of seeing a shark swim by. I love it. The sea makes me feel nostalgic for wonderful family holidays as a kid, relaxed as I feel the sand between my toes, thankful that I live in a country with such gorgeous coastlines to enjoy. My love of the sea, and my concern about the threats it faces were the drivers behind starting up Sea-Changers five years ago alongside Co-Founder Rachel Lopata. Sea-Changers aims to raise money for vital marine conservation projects around the UK's seas and shores. The idea is simple. We form relationships with marine related businesses to raise money for conservation and we do this for one simple reason…the oceans are in real trouble and they need our urgent help. I won’t quote the facts (but you can read them here). We all should care for the sea – not just because it is beautiful, life affirming and fun to be near; but because it is vital for our future and the health of our planet. It provides food, transportation, and oxygen for us to breathe. Since 2012 we have given out 47 grants to vital marine conservation projects around UK shores. Through innovative partnerships with marine businesses we are raising thousands of pounds for marine conservation. 100% of the money we raise through our marine business partnerships goes directly to marine conservation projects. Can show a long term positive impact on the marine environment. Are innovative in their approach. Are often grassroots or community based. Would not have happened without our grant. I love to run. I have run for many years now. I started in order to get fit, lose some pounds and to take away my guilt for eating too much chocolate. But over the years I grew to love it just for the feeling of it – the freedom of setting out, listening to my breath, having time for me, the feeling of achievement, the joy of all the stuff I see along the way. If I had to choose between being a diver or being a runner it would be a tough choice. Both have enriched my life but I think running may just come out on top – it makes my everyday life brilliant. So this year, I am thrilled to be able to combine my love for the sea with my love for running. No, I am not running a race whilst dressed in scuba gear (although that has been suggested!) or running whilst underwater (I have tried that and I don’t get very far). 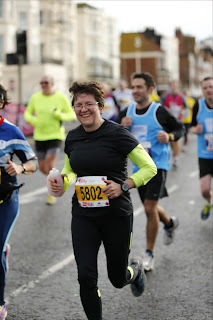 On the 24th April I will be running the London Marathon to raise money for Sea-Changers. The feeling of wanting to sleep most of the time – even when I am running! A feeling of constant excitement. So as the 24th looms I am nearing the end of this adventure. I have really loved it all and I am sure I will love the amazing opportunity to run the London Marathon. But I will love it even more if you can support my run. I am running to raise money for Sea-Changers that we can use towards future conservation grants. In addition, we are keen to develop our volunteer base to help us ensure Sea-Changers develops into a sustainable and even more effective charity. We would love it if you can help us with this. Please make a gift, no matter how big or small and help us develop our volunteer programme so we can continue to develop Sea-Changers. In addition, if you are also a runner, or doing any kind of sponsored event this year, please consider doing it for Sea-Changers. We make the most of every penny we have and appreciate every contribution made. So if you can support our work, that would be amazing, just get in touch as info@sea-changers.org.uk. And, if you are still not convinced, why not let Stephen Fry have the last word in this fab fundraising video. So proud of you and proud to call you friend, Helen. Wishing you all the best of everything for the 24th!